On 17 March 2017, SIAPS Ethiopia held a closing ceremony in Addis Ababa. 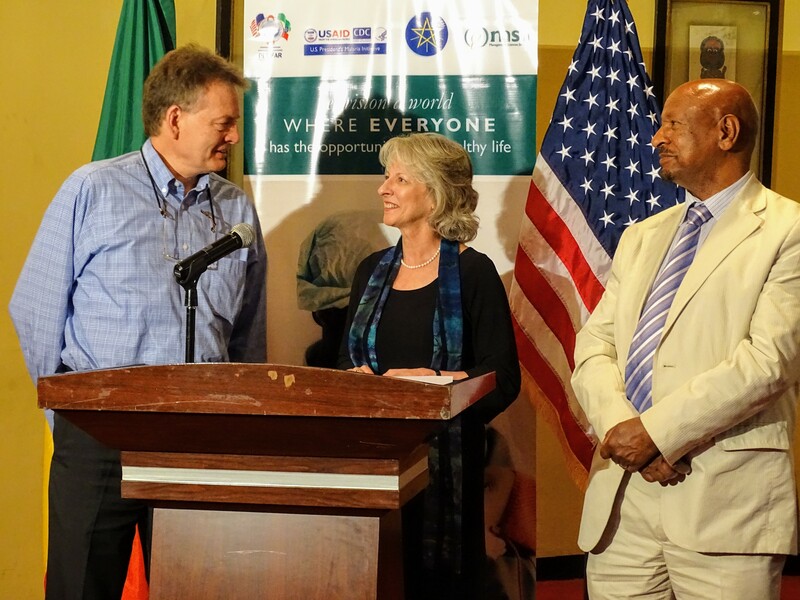 Guests from partner government and non-government organizations, USAID, universities and health facilities were present at the event and expressed their appreciation for the systems strengthening work SIAPS has done in Ethiopia. SIAPS has been in Ethiopia for the last five years working with partners such as the Federal Ministry of Health; Food, Medicines and Health Care Administration and Control Authority; Pharmaceutical Fund and Supply Agency; regional health bureaus and other stakeholders with the overall goal of strengthening the pharmaceutical system to ensure access to medicines and quality pharmaceutical services. In her welcoming address on the closing event, Olya Duzey, Senior Manager of the Pharmaceuticals and Health Technologies Group at MSH reflected on the achievements and impact of the global SIAPS program in improving health outcomes in more than 20 countries and how the work in Ethiopia has significantly contributed to the success of the global program. Negussu Mekonnen, Country Representative to MSH Ethiopia gave opening remarks in which he particularly highlighted SIAPS Ethiopia’s innovative interventions that have transformed the pharmacy sector in the country into a patient-centered practice. Introduced and supported by SIAPS, the Auditable Pharmaceutical Transactions and Services (APTS) and Clinical Pharmacy Services are two major examples that have seen big success in the country. Country Program Director to SIAPS in Ethiopia, Hailu Tadeg, provided an in-depth look into the successes and achievements of SIAPS in his presentation entitled, Reflections on Building Resilient Pharmaceutical Systems in Ethiopia. Looking back on five years of SIAPS implementation in Ethiopia, Hailu stressed on how listening to the needs of partner organizations and government authorities has been critical in the success of SIAPS in coming up with appropriate interventions. In its lifetime in Ethiopia, SIAPS supported the training of 7720 professionals, significantly contributing toward addressing the gap in workforce in the pharmacy sector. The program also supported 77 health facilities across Ethiopia to implement APTS and Clinical Pharmacy Services, 128 facilities to establish Drug Information Services and the establishment of Drug and Therapeutic Committees at 604 health facilities of which 46 are private hospitals. SIAPS also supported more than 1,000 health facilities providing ART services to document and report pharmaceutical data in support of decision making at different levels of the health system. 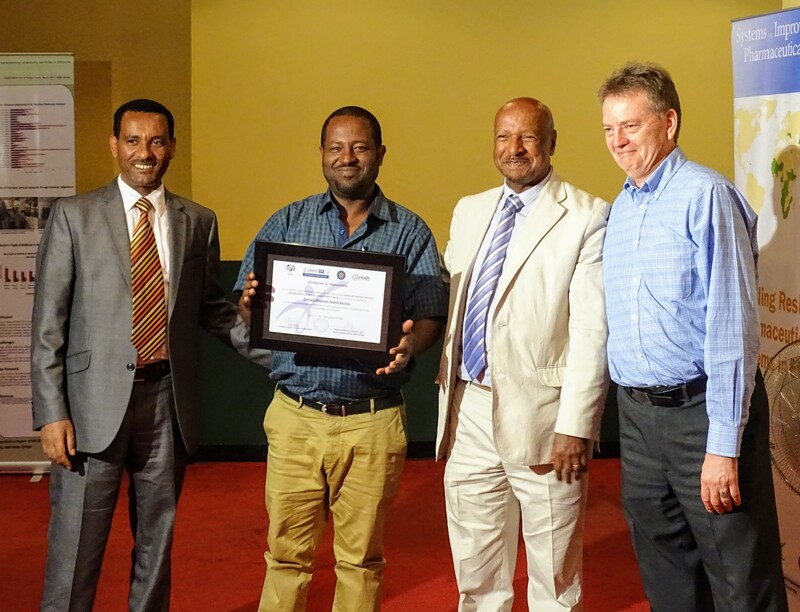 Hailu Tadeg, Negussu Mekonnen and Keith Hummel award a certificate to the representative of a regional health bureau. Heran also mentioned the establishment of the Health Regulatory Information Center at the Food, Medicines and Health Care Administration and Control Authority through the support of SIAPS. The center operates toll free phone lines 24 hours through which clients of the Authority and patients alike can call to inquire or report on medicines use, circulation of counterfeit and substandard medicines, unethical practices, and other health related issues. According to Heran, this has made information accessible to the public and increased transparency. The closing event was concluded by awarding certificates of appreciation to partner institutions in recognition of their valuable collaboration during the implementation of SIAPS in Ethiopia.